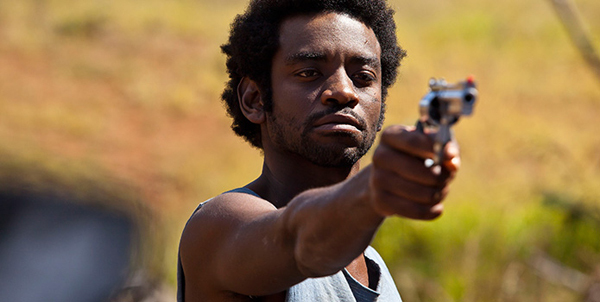 After being released from jail for killing his father’s murderer, Joao (Fabrício Boliveira) moves to the Brasilia to get a new start as a carpenter’s assistant. But soon, Joao’s cousin pulls him into the drug-dealing business. When a drug deal goes wrong, Joao finds himself being hunted by a group of corrupt cops and a rival drug lord. While on the run, Joao meets Maria Lucia (Isis Valverde), a privileged college student and daughter of a senator. This begins a passionate love affair that is more important to Joao than his own survival. Everyone is a criminal in this film, but the “good guys” (Joao and Maria Lucia) are redeemed by their love for each other. Since everyone is morally reprehensible, you know the bad guys are going to be “really” bad, but they end up being more like caricatures. That being said, the film, with its surreal and epic vibe, isn’t hurt by these over-the-top performances. It just adds to the film’s mystique. Both Boliveira and Valverde, however, play their roles with great nuance. They both did incredible jobs acting, and the chemistry between the two was palpable and electric. The film did drag in a few places, but all-in-all, it did a good job handling subplots and flash-backs. The film also put a spotlight on the racial issues in Brazil during the 1980s, pointing out the great educational and economic disparity between blacks and whites. The soundtrack was incredible, a good mixture of funk, punk, and disco from Brazil in the 1980s. I found myself tapping my toes throughout the entire film. And as with any good western, the film includes large-scale shoot-outs and ends with an epic final stand-off. This film is worth seeing. It won’t change your perspective on life, but you are guaranteed to enjoy yourself. I would love to see this film turned into an opera or play. There is so much love, hate, vengeance, and violence. The plot seems driven straight from Shakespeare. This entry was posted on Saturday, April 5th, 2014 at 1:07 pm	and is filed under Film, News. You can follow any responses to this entry through the RSS 2.0 feed. You can skip to the end and leave a response. Pinging is currently not allowed. « DIFF 2014 Film Review: ‘Little Accidents’! !